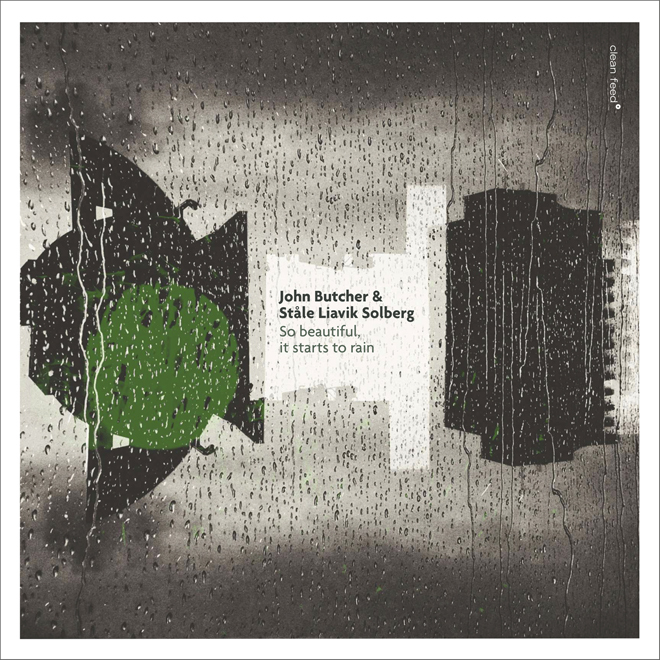 Avant soprano and tenor magician John Butcher returns for a bracing duet with drummer Stale Liavik Solberg on So beautiful, it starts to rain (Clean Feed 390). After a significant session with the Red Trio that I covered here a short time ago, he seems to be on a roll. Here he turns in a rousing set recorded live at Cafe Oto. Solberg keeps up quite effectively with Butcher, matching him sonically and gesturally, whether it be a matter of high-pitched cries, spatial explorations or massive blocks of impactful energy. Of course a sax and drum duo can take any number of directions, for better or worse. What's remarkable with this set is the artistic creativity each reaches deep to achieve. It tumbles freely forward, exploring expressive spontaneities with a good sense of space and pace. It's another fine example of Butcher's art and speaks well for the drumming musicality of Solberg as well.